Cluttered coffee tables and living rooms can be a thing of the past with the help of this gorgeous and functional storage ottoman. Square-stitched upholstery in cream and grey tones blends well with nearly any colour palette, while the beautiful print adds visual interest. Tuck away unnecessary clutter in the ottoman's base. 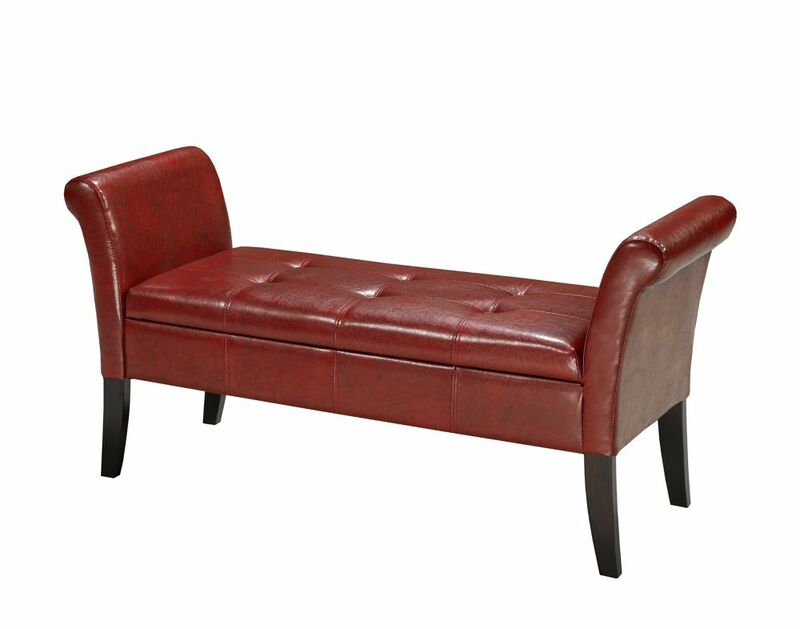 Enjoy this decorative combination of style and function with this single bench from CorLiving. Upholstered in red bonded leather the LAD-259-O is easy to wipe clean with a damp cloth and provides a practical solution as extra seating at a table. Adding a touch of style to your home decor with a foam padded seat surface accented with contrasting white top stitching. This functional small scale single bench can easily be tucked out of the way or be used as an accent piece anywhere you need it most. This skillfully designed Corliving bench is just the piece you need to make your space complete. The combination of a solid wood base in a red finish is perfect for adding a contemporary feel to any room. Your home will benefit from the unique and well-constructed red frame. Hallway Bench with Storage, Red Add refinement and sophistication to your office, entryway or living space with this tailored storage bench. Tufted accents, bevelled arms and curved outer framing are wrapped in luxurious faux leather for easy cleaning and very low maintenance. Easily conceal small items using the in-seat storage. Hallway Bench with Storage, Red is rated 5.0 out of 5 by 1. Rated 5 out of 5 by Sunshine from Beautiful Very beautiful bench. Looks amazing . Easy to assemble and great storage. Came on time just some missing hardware and that was my only disappointment.